Taken the following day, these images show you the after effect of the treatment on my freckles and pigmentation; that's my sun spot in the top right shot, which has now faded considerably! 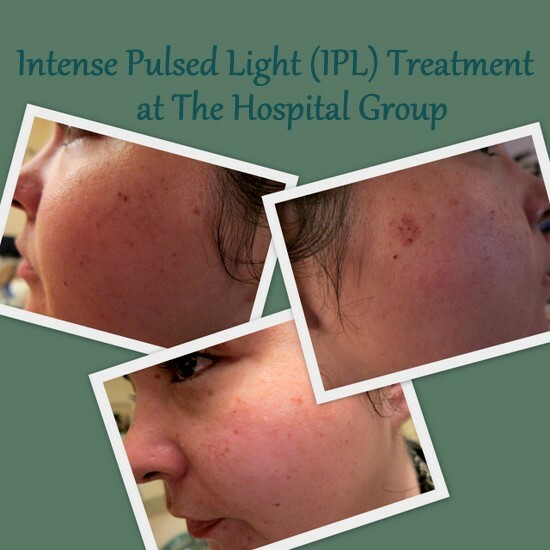 Yesterday I showed you the results of my Fire and Ice treatment at The Hospital Group, and today I want to tell you about my experiences with Intense Pulsed Light (IPL). Creams, lotions and potions can only do so much and laser treatments are increasingly popular, targetting a host of skin complaints from loss of texture and tightness to fine lines and wrinkles, pore size, redness and other signs of aging. I was most concerned about skin pigmentation/discolouration, particularly a large sun spot, and I also hoped to tackle the perma-congestion around my chin. IPL works by heating the cells to stimulate production of collagen within the skin and while a series of treatments is advised to build up maximum impact, I achieved noticeable and impressive results with just one treatment. But I won’t lie: when I was offered the chance to try this treatment, I thought long and hard about it. I’d heard IPL can be painful, and worried about how my skin would react. These worries weren’t helped by the fact that I developed a slight (probably unrelated) rash after the first patch test, so my very patient laser practitioner, Jenny, administered a second one just to be sure. Everything was fine, and we forged ahead. The procedure itself wasn’t painful, but involved intense bursts of heat and light that made me flinch a little around my nose and lip. It was slightly uncomfortable, but tolerable. The sensation has been compared to a rubber band being snapped repeatedly against your face. It’s quick, though, and my entire face was treated in around 10 minutes. Immediately afterwards, my face felt warm, tight and a little irritated. Jenny smoothed on some aloe vera gel which gave me instant relief, but my skin continued to feel tight for a few hours. Straight away, my freckles started to darken quite dramatically: while this is a good sign, meaning the treatment worked on my pigmentation, it looked terrible, like a rash or bad acne. I was glad I’d had it administered on a Saturday, which gave me a day to hide out while the marks faded. The following morning -- a miracle! The congestion on one side of my chin had mysteriously vanished, although a couple of small pimples had appeared on the other side. My freckles looked less angry and red, and more like very dark brown marks (see pics, above). By Monday, I was able to cover up with La Roche Posay’s excellent compact for sensitive skin and the marks were barely noticeable; by the end of that week, they had faded entirely. And, so had my sun spot! Well, almost: it's gone from being very obvious and dark in colour to being barely noticeable at all. You will see it if you’re looking for it, but I am much less conscious of it being there and my confidence has increased as a result. The treatment has also fixed the congestion around my chin but, strangely, only on one side -- there are still a few lumps and bumps on the other. I have no doubt that further treatments would be of great benefit and, if it wasn’t for the expense of Christmas, I’d already have booked myself in. An IPL Laser Skin Rejuvenation Treatment costs from €90 per session at The Hospital Group; typically a course of 4-6 treatments is advised, although this will be worked out as part of your initial consultation. Check out the website or call 1850 20 40 90 to book an appointment at your nearest clinic. Wow - fantastic ! The photographs are a great way to help highlight the results. Thanks guys, I hope this helps people who have been wondering about this type of treatment or are considering it but not sure what's involved...it always helps me to read up on things first! Great to hear you found it helpful! You should go for it, I thought it was brilliant and it's 50% off at the moment - bargain! Really informative post, thanks for posting about it. That's a really huge difference! Thanks ladies, I'm definitely a convert to this type of treatment!